Be In The Know — Top advice from successfully committed athletes. College athletic recruiting can be a daunting task. In fact, that’s the reason why BeRecruited was founded in the first place – to make it easier for athletes and coaches to connect. Our network provides the tools for athletes to make the connection. As we most often hear from athletes, the recruiting search is not a process in which you can sit back and relax. To help you better understand the college athletic recruiting process, we turned to our successfully recruited athletes to find out what they wished they'd know about the recruiting process in high school. Over the last two years, BeRecruited athletes have committed to more than 2,000 NCAA, NAIA and NJAA colleges. When they commit, we ask them what advice they would give to other athletes starting the recruiting process. We took tens of thousands of answers and ran some simple analysis to find the most used words, sentences and sentiments. First we looked for frequency of individual words. These are the top 50 words that appear in the feedback we received. Some of these words are obvious, such as coaches and college. 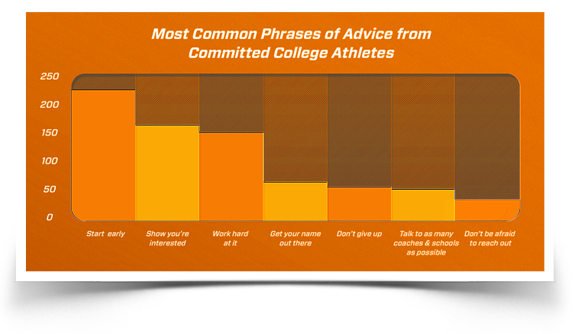 However, it’s the verbs and adjectives that really start to tell us what athletes like you think are important in the recruiting process. Words such as early, hard, persistent, proactive, visit, work and contact. These words give us a sense of what’s important, but don’t provide too much direction. Let’s go through each of thoughts individually to give you more of a flavor of what athletes said and why they said it. Getting recruited is not something that happens overnight. It can take anywhere from months to years just to get to a verbal commitment (another reason to start early). The coach is making a big commitment to you, and they want to make sure they are getting a quality athlete. From an athlete’s perspective, you’re making a huge decision, and want to make sure you’re making the best decision you can with the information you have. So it really is in everyone’s interests to start early. Set-up a basic profile, and start researching schools today! College coaches have endless sources to find athletes that are a fit for their program. When you show coaches you're interested, you give coaches an advantage by knowing they do not have to sell you on their program. You can show that you are interested in a variety of ways, some examples include: sending beRecruited profile invites, emailing letters of interest, mailing coaches a copy of your highlight video and planning college visits. Extend your athletic competitive nature to recruiting. You know that your accomplishments don’t happen overnight. Work hard to find the right college and program while also applying yourself in the classroom and dedicating yourself to perform at the highest level in your sport. As you make improvements, such as your test scores or athletic stats, update the information in your BeRecruited profile, so coaches can keep track of how you are progressing through the season. BeRecruited allows you to develop an online resume to connect with college coaches. While your information is seen and searchable by coaches it is also important for you to be contacting the programs you are interested in attending. You can view colleges and search for the requirements you are looking for by using BeRecruited’s College Search. It is important to understand your ability and what level of competition is the best fit for you. Once you have focused on the colleges that are the right fit for you, be persistent in reaching out to the coaches. You can be proactive in contacting the coaches by speaking to the coach directly, attending summer camps or taking college visits. Talking to many coaches and schools not only increases your odds of finding a program it also allows you to see what other opportunities exist. Many of the athletes who use BeRecruited have been contacted and/or committed to a college they had not heard of before joining BeRecruited. The athletes who are most often contacted by coaches have built a profile that includes their academic info, up-to-date athletic stats and a highlight video that allows the coach to see their ability in action. 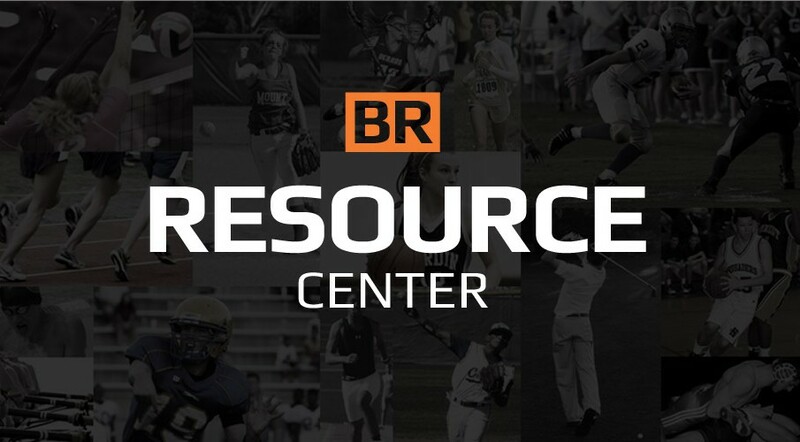 Not only is it important to utilize resources like BeRecruited to gain more information about your list of interested coaches, but there are also various individuals and recruiting services you can reach out to help with the recruiting process. We have reviewed the resources on the NCSA website and found them to be very useful. Your high school/club coach, graduated teammates who are now competing in college or other high school personnel are valuable resources to which you have access. By receiving feedback on your athletic and academic performances you will be able to adapt and make changes, so you can continue on the right recruiting path. We hope this post was helpful in getting you ready for recruiting season. If you want an edge in recruiting, we encourage you to sign-up and set up a profile now at BeRecruited.com.